The bicep is a much loved muscle in weight training. But the tricep is quite often neglected or in some cases not done at all! (bringing in the saying ‘all bicep no tricep’). The tricep extension is one great way of developing them. Another great reason to do them is that if you want big arms then they are important to getting that size. 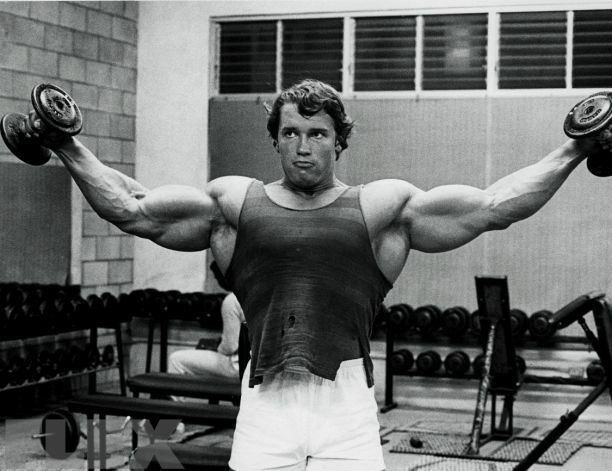 Note the picture below of Arnie – how much smaller would his arms be if he skipped those tricep muscles? The triceps (along with the whole arms) are a great aid to any sport – from running – which supports a strong sprint, boxing for a powerful punch, to the strength for overcoming opponents in any team sport. People sit down doing this, others lay or sit up right on a bench, but in my humble opinion it is best to a stand-up to do this exercise and that is for the simple reason that I feel it is much better for the posture. Have some great arms that get you noticed… or envied! Go light at first and workout how heavy you can go. By going too heavy too quickly you might end up dropping the weight and as it’s at the back of the head and neck that might be a bit embarrasing. Never neglect them tricep kickbacks lol!